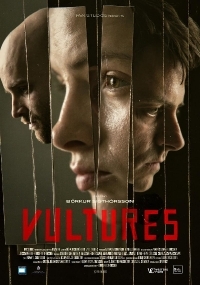 Brothers with seemingly disparate careers, missing millions, drug mules; this is all part of Icelandic director Borkur Sigporsson's feature film debut Vultures. Vultures centers on two bothers, one a small-time criminal, the other a banker, who find themselves working together to smuggle drugs into Iceland with the help of a young Polish girl as their mule. Things go wrong, bad people get angry and undoubtedly, some sort of showdown is in the cards. Though this is Sigporsson's feature debut, he had a hit a few years back with the police procedural "Trapped" which was created by Baltasar Kormakur (101 Reykjavik, Jar City, The Deep). Kormakur also produced Vultures. Nordic thrillers have their own unique look and Vultures certainly seems to fit the bill but admittedly, it's been some time since I've seen one with a story that was appealing and I love the fact that at the centre of this story is a young woman who is clearly going to shake the boat. Vultures will be making its debut at the Cannes film market.